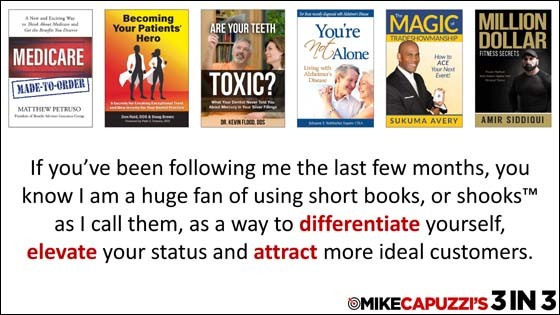 If you’ve been following me the last few months, you know I am a huge fan of using short books as a way to differentiate yourself, elevate your status and attract more ideal customers. 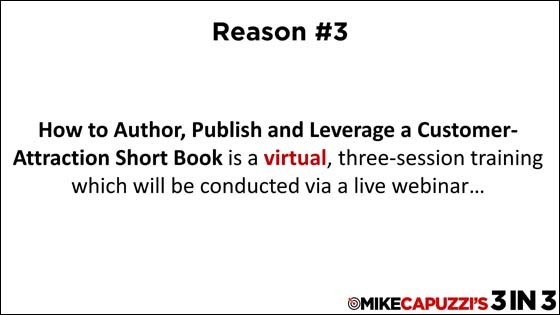 On this episode, I want to share the news of my first virtual training class of 2019, where I am going to show you how to author, publish and leverage a customer-attraction short book in your business and give you three reasons why to join me this May, so get ready for 3 in 3. 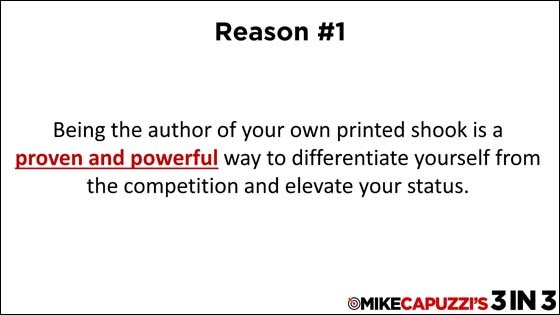 Being the author of your own printed shook is a proven and powerful way to differentiate yourself from the competition and elevate your status. In reality, you are no different than your competition unless you are published, and targeted people are reading your strategic content. Something “magical” happens when you hand somebody your shook, and this May I want to show you exactly how to create one for yourself! 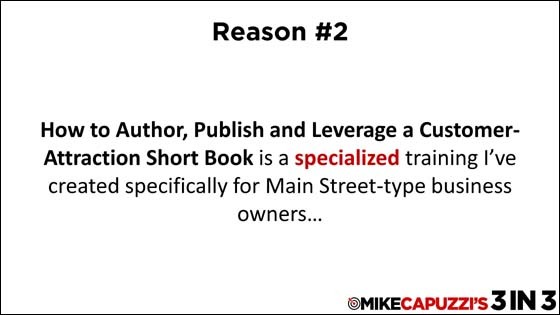 How to Author, Publish and Leverage a Customer-Attraction Short Book is a specialized training I’ve created specifically for Main Street-type business owners to share my own unique “recipe” for creating a customer-attraction short book and then effectively building a book-centric marketing system around it. While authoring a book is great, it’s only part of the equation and you must know how to use it for lead generation and lead follow-up. Main Street-type business owners have their own unique challenges and opportunities for leveraging their shook and this May I will show you exactly what to do! How to Author, Publish and Leverage a Customer-Attraction Short Book is a virtual, three-session training which will be conducted via a live webinar so anybody in the world can attend from the comfort of his/her home or office. No travel expense or hassle is a HUGE BONUS! And speaking of bonuses, I have several “early bird” bonuses available for people who take fast action. How to Author, Publish and Leverage a Customer-Attraction Short Book is a powerful, convenient and cost-effective opportunity, so don’t delay in registering. Get all the details and save your seat by visiting www.ShortBookSuccess.com. So that wraps up this episode of 3 in 3. If creating a powerful marketing asset like a customer-attraction short book interests you (and I think it should), make sure you register today for my How to Author, Publish and Leverage a Customer-Attraction Book virtual masterclass and until next time, keep on marketing!